The Christmas season is here! I love Christmas--how about you? As much as I love Christmas, I know how much "extra" is involved in this season. I spent eight hours last weekend decorating and hanging lights. The ingredients are ready for my annual baking, but I haven't mixed up dough yet. My shopping is finished, but the wrapping hasn't started. Christmas concerts, gatherings, and feasting still await. I'm excited about all of it...yet I know exhaustion and anxiety threaten. How are you holding up amid all the Christmas "extras" today? Last Friday, I grabbed a "slow moment." I sat at the kitchen table with a new cup of hot tea. The house was totally quiet, except for the sound of birds pecking at the sunflower seeds I'd scattered on the back porch. Two clementines waited for me on my plate. While I peeled them with my fingers, feeling the smooth rind, I took in their fresh scent. I listened to the interesting sound of the sections separating from each other. I remembered the first time I ate clementines, in the mid-1990's. My sister worked at a fresh food market, and clementines were only available in December. She brought them home in a wooden box filled with wood shavings, all the way from Spain. Expensive, beautiful Christmas treasures they were. Now clementines are grown in the U.S. and we can eat them year-round. In that quiet moment, I praised God for the simple gift of clementines. In that "slow moment," my senses were engaged. Sight, sound, taste, touch, scent. When my senses were engaged, and not interrupted by December's busy pace, praise spontaneously rose up. And I felt the Prince of Peace right beside me. 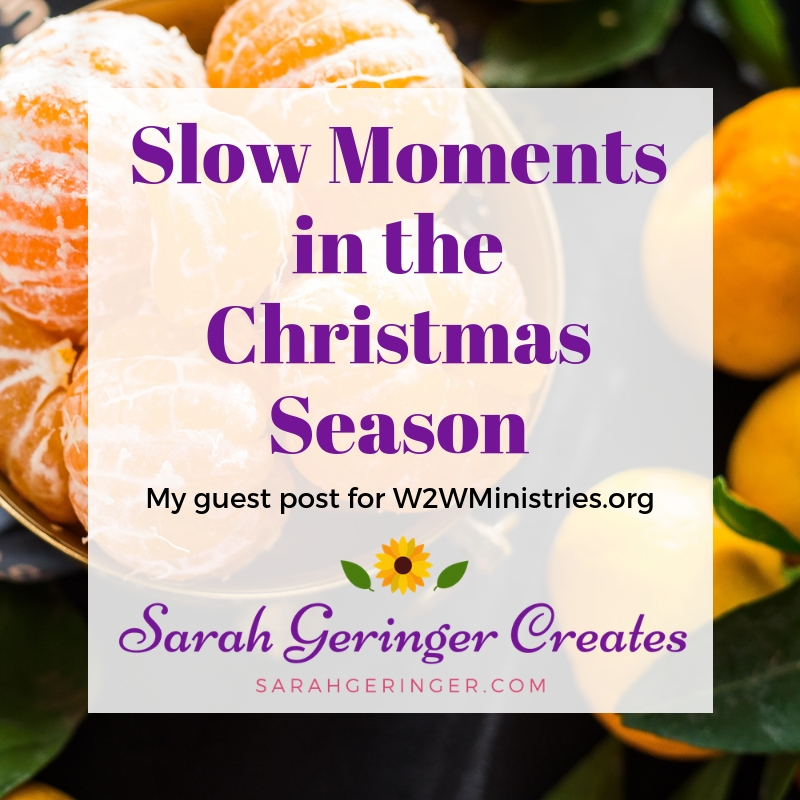 My hope today is that this devotion encourages you to take a "slow moment." Use your senses to be fully engaged, and notice how praise rises up. 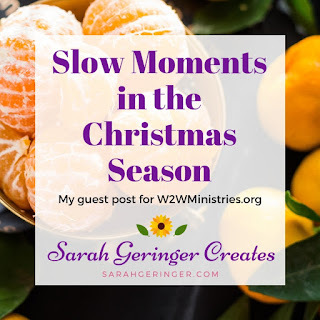 Feel the presence of the Prince of Peace in your own "slow moment." 1. How has the hustle and bustle of the Christmas season already impacted you? 2. When will you take a slow moment today? Sarah, the mention of clementines brought such a smile to my face. One of my favorite "slow moments" of my afternoons this time of year is a cup of tea and a clementine. Just the fragrance as I peel it brings me a calm and sense of joy. Blessings! We all need to take these moments, especially when life gets ramped up and the list of to-dos grows long, Sarah. I love how you walked us through what you did to slow your heart and mind and be present this Christmas season! Pinning, my friend!